Taken 1937 Oct 14 Thursday. On the Wirksworth-Brassington road, at the foot of the Hopton Incline on the CHPR. Eight days after the accident, the remains of 27521 waiting to be hoisted up the embankment. Taken 1937 Oct 14. 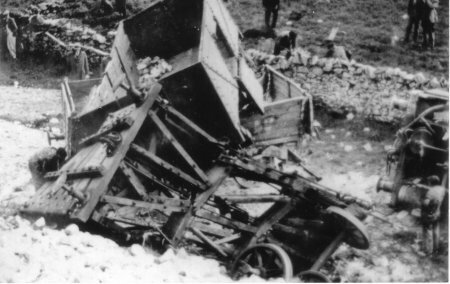 Wreckage of 4 wagons loaded with limestone and a brake van. Taken 1937 Oct 14. A hand-crane being used by the toiling shop staff to haul a set of driving wheels up the embankment. The large steam crane normally used could not negotiate the tight curves and steep inclines of the High Peak Line. Later, boiler and frames would need more than one hand-crane. 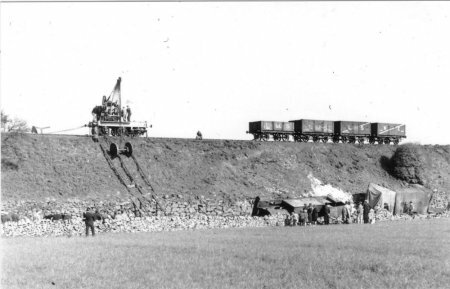 Remains were loaded into the wagons, to be taken away by sister loco 27530. 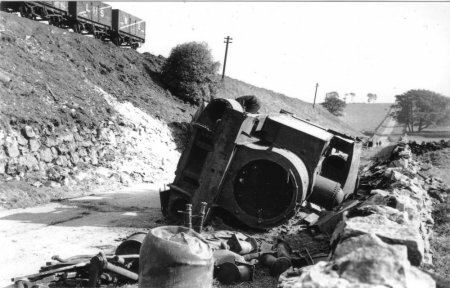 On Wednesday 6 Oct 1937 there was a derailment near the foot of the Hopton Incline on the Cromford and High Peak Railway. 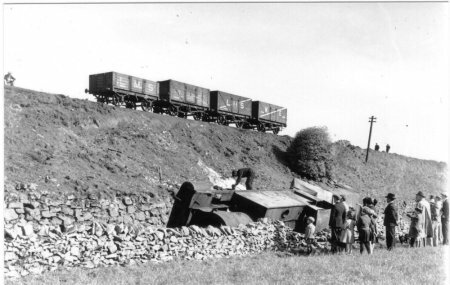 Ex NLR 0-6-0T number 27521, with four loaded wagons and a brake van, derailed at 45 mph on the curve while working up speed to climb the incline, killing the driver William Boden. The train was the 8.35am Middleton Top to Parsley Hay freight, with four wagons loaded with limestone and a 20 ton brake van. It rolled down the 30 foot embankment, demolishing a 6 foot high stone wall. Sleepers were smashed and rails torn up for 50 yards, and the sound of the crash and the escaping steam was heard for half a mile. William Henry Boden, driver aged 53 was thrown clear but sustained multiple injuries. He was rushed to Wirksworth cottage hospital but died in 3 days. Harold Kirk, fireman aged 47, was trapped in the cab and found to have internal injuries, and a fractured arm and pelvis. Thomas Swift, guard aged 52, rendered assistance to the others in spite of his own injuries. The engine 27521 was dismantled and taken to Derby for examination before being scrapped. Fireman Kirk explained that he had worked on the line for 25 years, and had been firing for Driver Boden for 7 years. Three men who were in the brake van agreed that the speed had not been excessive, but one remarked that the engine was "rocking rather badly when approaching the curve. The Inspecting Officer of railways Lt-Col Woodhouse took evidence from another driver that when attacking the ascent of the Hopton Incline, it was his practice to go "all out" when emerging from Hopton tunnel, which is about three furlongs short of the curve where the derailment took place. 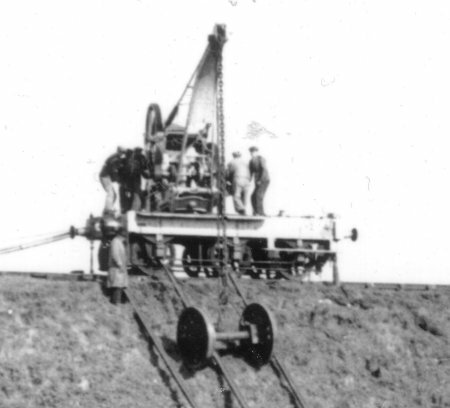 The track had been relaid in 1935 with "serviceable" ex L&NWR main line rails, originally weighing 90 lbs per yard, but when inspected following the accident had worn down to 81 lbs per yard. It was stated that the track was frquently misplaced at this point, and the report emphasized that a better class of ballast than ash was desirable. No blame was attached to driver Boden "a man considerably experienced, with a very good record", rather was the cause of the accident a combination of factors, particularly the "nosing" proclivities of the NLR tanks, and the necessity to "rush" the bank, together with an exemption - at that point - from observance of the general line speed limit of 30 mph. In conclusion, Woodhouse observed that the company's action, taken immediately after the accident, to define the speed limits more clearly, and reduce the train loadings to conform with the new "permissable speed should be welcomed, and strictly adhered to, be instrumental in preventing a reccurence of such a catastrophic derailment in future. "Railways of the High Peak" by N Jones and J M Bentley. Source:Copyright C M & J M Bentley.